Information for this posting is derived from the following sources: Design News Daily: Ms. Ann Thryft and NASA-Ames Research Center. It is no secret that missions sponsored by the United States using manned space craft have been eliminated from the federal budget. After Apollo the “wise men” in our federal government decided there was no need to continue the effort. “We can always hitch a ride with the Russians”. Hitching a ride has turned out to be extremely expensive, not to mention giving up our hard-won position of technological dominance in that field of endeavor. One day we will wake up to discover the Chinese have landed a man on the Moon and have declared that body to be their real estate. Abdication of our position in manned space does not mean NASA is not working and shifting their focus to other areas of research. One absolutely fascinating area is described as TENSEGRITY. 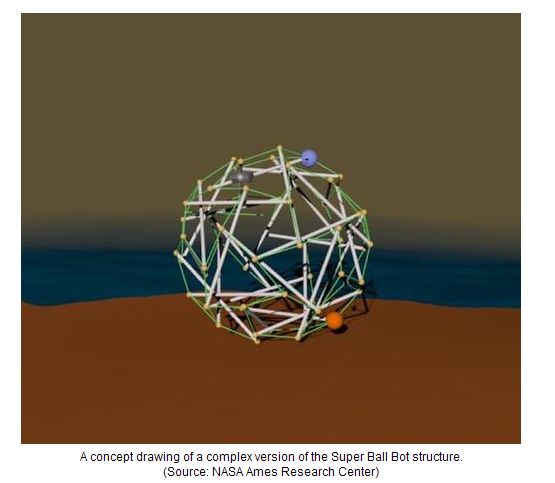 Tensegrity uses Super Ball Bots, which look like spheres, but constructed quite differently. 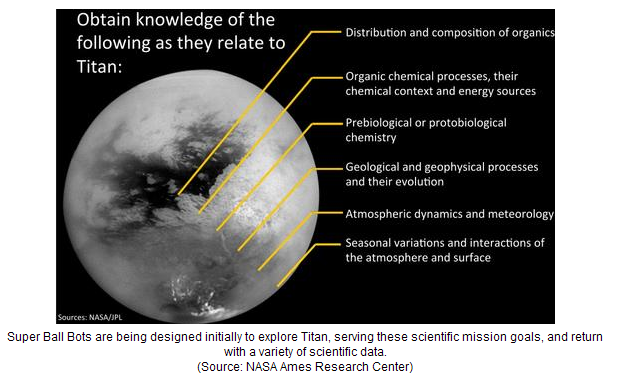 They’re being designed to go to Jupiter’s moon Titan. 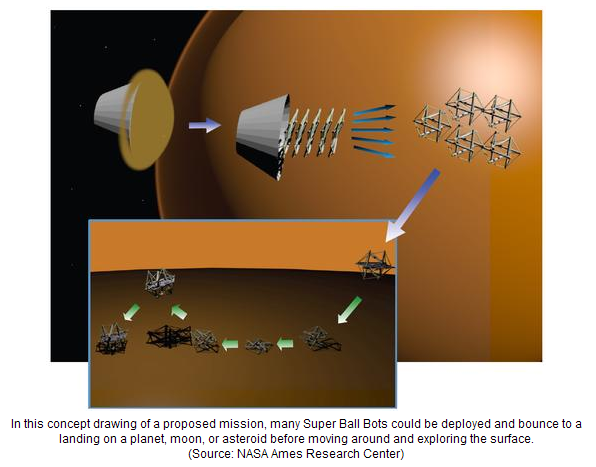 Like the robotic droplets, Super Balls Bots’ main mission is gathering scientific data. The larger version, with a mass of 75 kg, will carry all three scientific instrumentation packages: Atmospheric and Meteorology, Analytical Chemistry, and Imaging. The smaller version, with a mass of 40 kg, will carry only the Atmospheric and Meteorology and Imaging packages. These are described in some detail in a presentation given last spring by the main researchers at NASA Ames Research Center. What’s different about them is they’re constructed according to the principles of “tensegrity,” a term coined by Buckminster Fuller, known for popularizing the geodesic dome. The term combines “tension” and “structural integrity.” It works on principles of how force is distributed through a structure that are different from those of rigid structures. Tensegrity’s global distribution of force gives maximum strength to a structure without adding a lot of weight, and minimizes the number of points of local weakness. Many natural forms are constructed this way, such as microtubes and microfilaments within cells. The human skeleton is an example of biotensegrity. Small, light-weight and low-cost missions will become increasingly important to NASA’s exploration goals. Ideally teams of small, collapsible robots, weighing only a few kilograms apiece, will be conveniently packed during launch and would reliably separate and unpack at their destination. Such robots will allow rapid, reliable in-situ exploration of hazardous destination such as Titan, where imprecise terrain knowledge and unstable precipitation cycles make single-robot exploration problematic. Unfortunately landing lightweight conventional robots is difficult with current technology. Current robot designs are delicate, requiring a complex combination of devices such as parachutes, retrorockets and impact balloons to minimize impact forces and to place a robot in a proper orientation. Instead, we are developing a radically different robot based on a “tensegrity” built purely upon tensile and compression elements. Such robots can be both a landing and a mobility platform allowing for a dramatically simpler mission profile and reduced costs. These multi-purpose robots can be light-weight, absorb strong impacts, are redundant against single-point failures, can recover from different landing orientations and are easy to collapse and uncollapse. These properties allow for unique mission profiles that can be carried out with low cost and high reliability. We believe tensegrity robot technology can play a critical role in future planetary exploration. 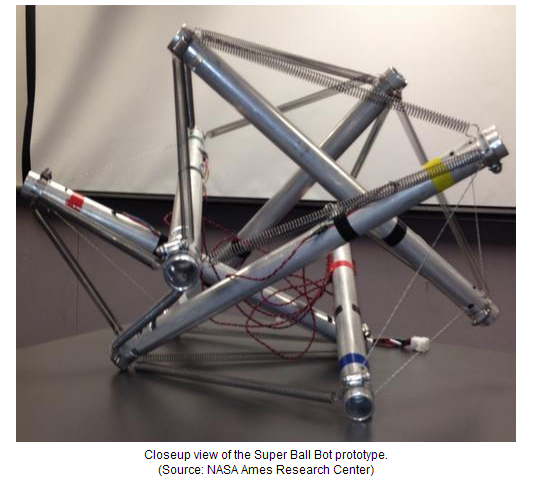 Our Phase II study will build a prototype tensegrity landing and mobility platform in hardware. The primary focus will be on demonstrating mobility, and formal evaluation of payload protection in hardware. In Phase II we will attempt to show that control is robust and practical. In Phase II we propose to evaluate closed-loop control methods that allow the tensegrity to sense and navigate to a desired location. In addition we will evaluate control for larger tensegrity designs, robustness in difficult environments, and extend control to low-gravity environments. Tensegrity robots have the potential to revolutionize many different mission destinations. We will extend our Phase I trade-study for a Titan mission to include the critically important thermal and energy analysis, large-scale tensegrities that are capable of offering more payload protection and improved mobility, as well as low-gravity landing and mobility analysis unique to small asteroids. Completing Objective 1 will give insights into costs, performance, risks, development time and technologies that will be needed to make a viable platform. In addition it will dramatically improve confidence that tensegrity structures are a good platform for landing and mobility. 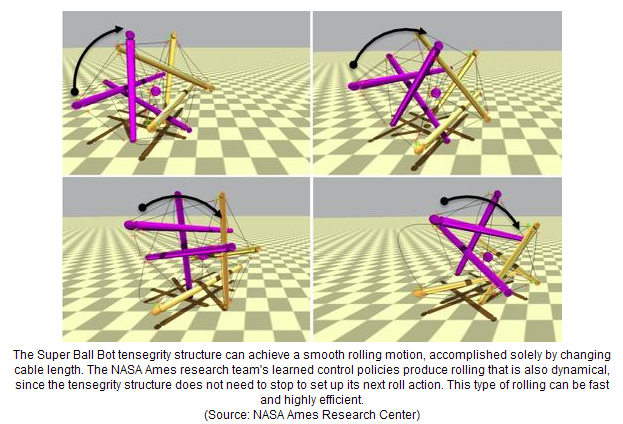 Completing Objective 2 will validate that a tensegrity robot is a viable mobility platform that could dramatically reduce cost and increase reliability of missions that need mobility. Completing Objective 3 will allow us to evaluate the costs, risks and benefits for using tensegrities for a wide range of missions. Success in in this study could dramatically reduce costs and increase reliability for all NASA missions that use robotics, or need a landing platform. The following slide indicates how the ball-bots are deployed. You can see from the JPG above the structure is composed of interlinking rods and tubes capable of supporting scientific instrumentations while surviving a “hard” landing on a rigid surface. The basic concepts are given below. Three structural types were considered. To me, the most remarkable feature is how the bots are collapsed for storage and travel. There were multiple schools involved with the research and development of these devices. In the NIAC project report, there are twenty-six (26 ) students involved; five (5) schools “state-side” and three (3) schools from various parts of the world. Marvelous collaboration on this one project WITH published papers spreading the information. In my opinion, this is the way we “kick the can down the road”. I definitely applaud the work of NASA and the institutions involved with this project. I definitely welcome your comments. My company, Cielo Technologies, LLC, is involved with designing equipment to automate manufacturing process using work cell methodology. Very frequently we have the need to include conveyors to move components into a cell and convey completed assemblies from a cell. 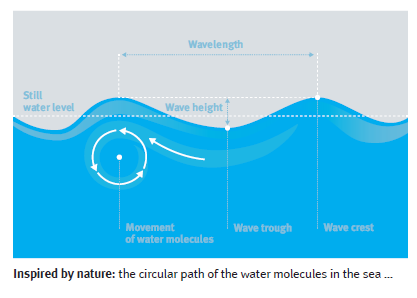 I recently was made aware of “MODULAR WAVE HANDLING” technology from research accomplished by FESTO AG & Co., KG in Germany. 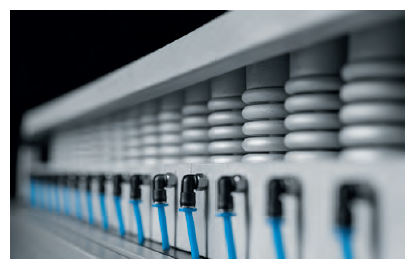 I have used FESTO pneumatic equipment for many years and can certainly attest to their quality and technical support. The information that follows is from that company. Hope you enjoy this one. 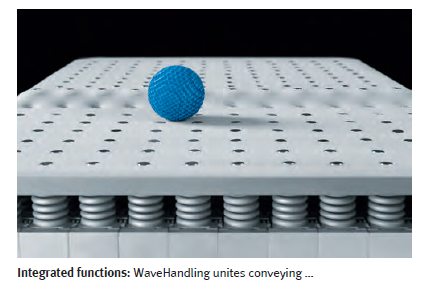 Just like waves in the ocean, the modular conveyor moves articles gently from point to point. A cross-section of the conveyor is shown by the two JPEGS below. Individual pneumatic modules are actuated providing motion to lift and lower upper sections of the conveyor, thus moving products forward. 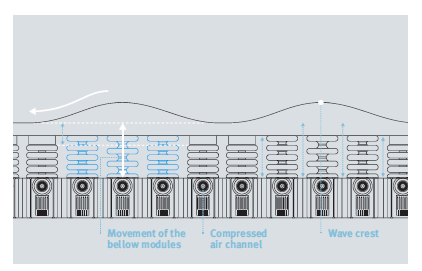 This wave motion is controlled by software actuating spring-loaded modules strategically located under the solid surface. You can see the entry port for tubing that carries air pressure internal valving internal of the device. 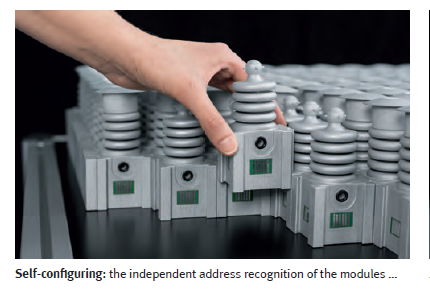 Absence or presence of pressure is determined by programming PLCs instructed to open or close the bellows assembly modules. That configuration is given below. I think this is a remarkably innovative solution to a problem that has been with us for years. The product has not been commercialized as yet and, regrettably, we do not have cost figures for the individual modules nor the fabric surface covering the modules. As with any innovation, I suspect costs will drop as purchases are made and equipment installed. I definitely intend to “stay close” to any developments and news from FESTO. We consistently derive our designs from nature and this is one great example of that being the case. Hope you enjoyed this one and please give me your comments. I graduated from the University of Tennessee in 1966. (Yes I’m old as dirt.) If you attend a school in the SEC (Southeastern Conference) you know that SEC football is not just an NCAA Division I sport, it’s a religion. Seemingly, we live and die with the success or failure of the teams we support. One of the best coaches in the SEC was Bill Battle. Some remember he became head coach at the age of28. His teams did extremely well in his early years but struggled at the end of his tenure. Battle coached at Tennessee from 1966 to 1969. His worst record was 7 and 4, BUT he lost to Alabama and coach Bear Bryant four years in a row. That was his downfall. Battle never coached again after he left UT but did become a successful businessman in the licensing business. To win, you must have coaching talent AND the personnel to take the game from concept to the playing field. YOU MUST RECRUIT THE VERY BEST PLAYERS—AT ANY COSTS if you are to compete in the SEC. This is where it gets interesting. If you read my postings, you know I generally concentrate on education and specifically engineering education. CNN and the ELEVEN WARRIORS web sites have recently published findings that represent the ultimate shame, in my opinion, relative the NCAA Division I football and basketball. The information from this blog highlight the situation as recorded by both sites. On the ACT, it was discovered that some students scored in the single digits. The highest possible score is 36 and the national average is 20. In most cases, the team average ACT reading score was in the high teens. In the group of more than 29,000 student-athletes who entered Division I institutions for the first time in 2012, only 16 were certified as eligible with test scores below 600 (or the ACT equivalent) – which is .05%. Of those, only 2 were in the sports of men’s basketball or football. Only 68 were certified as eligible with scores between 600 and 700 (0.2%). Of that group, 28 were men’s basketball or football student-athletes. Test scores and GPAs are very highly correlated. This is why it is a very rare event to have a very low test score, but grades high enough to be certified as eligible. It is only slightly more common to see very low grades paired with a high test score. It has been stated: “College textbooks are written at the ninth-grade level, so we are putting these elite athletes into classes where they can’t understand the textbooks. Imagine yourself sitting in a class where nothing makes sense.” This happens year after year. Periodically since the 1980s, stories have surfaced of athletes who could not read. — Former basketball player Kevin Ross told ESPN’s “Outside the Lines” about his struggles at Creighton University in the 1980s. — In 1989, football player Dexter Manley told Congress that he got through college and into the pros without ever learning to read. — Dasmine Cathey’s compelling story of struggle at the University of Memphis was recounted by The Chronicle of Higher Education in 2012. And as far back as the 1980s, faculty and staff have spoken up about illiterate athletes who are pushed through with passing grades to keep up their eligibility to play, while their reading was little addressed. Linda Bensel-Meyers, who worked for Tennessee until 2003, said a university-hired psychologist would diagnose learning disabilities in athletes and put them in a program without the graduation requirements set for other students. “Many of the records I looked at revealed that these athletes came to us essentially illiterate and still left the school functionally illiterate,” Bensel-Meyers told CNN. If you consider the number of players seeking to enter the NFL or the NBA, you see an overwhelming number do not make it. There is simply too much competition. OK, let’s say a player does make the “bigs”; he can expect to play, on average, four (4) years. That’s all—just four years. Then what do they do? Without proper education, they become no different than a person never having played. The NCAA is aware of this situation and yet “big money” drives the system and no real corrective action is being taken to stop this shameful process. TOO MUCH MONEY. They players become pawns in a system destined to use them and throw them away. I certainly appreciate your comments and rebuttal. 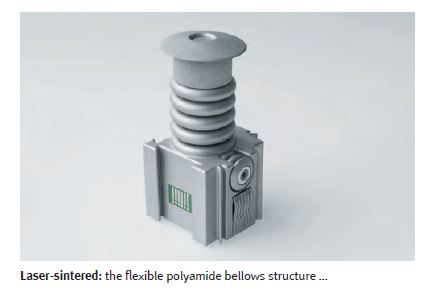 The idea for this post comes from “Plant Engineering”, May 2013 publication. If you are in the engineering profession you know that counterfeiting of components and assemblies is a huge problem for tier one suppliers and end users. Counterfeiting of well-known brands and products is a growing problem estimated to be between five and seven percent (5%–7%) of world trade. This represents approximately $600 billion (yes with a “B”) each year. Some months ago the Machine Design Magazine published an article highlighting this issue with fasteners imported into this country. Many of these fasteners did not meet standards and specifications required by companies and agencies doing the purchasing. The life expectance was, in some cases, greatly diminished and premature failure under load was a huge factor. The Department of Defense (DOD) was greatly concerned and started requiring much closer incoming inspections for fasteners purchased from overseas suppliers. Counterfeit health and safety products such as electrical and electronic assemblies now occupy second place after pharmaceuticals on the list of those most frequently seized by U.S. Customs. Electrical products with off-quality assembly and “bogus” components can overheat causing fires, shock hazards and other significant safety problems. These illegal products do not need to comply with performance and safety specifications and they many times are not tested and approved through a third party agency. By definition, a counterfeit is a product, service, or package for a product that uses, without authorization, the trademark, service mark, or copyright of another intended to deceive prospective customers into believing the product or service is genuine. This makes detecting the difference between a counterfeit and authentic product very difficult. BUY AUTHENTIC—The very best way to avoid counterfeit products is to make purchases from the manufacturer’s authorized distribution network or resellers. Traceability can then be assured. VERIFY AUTHENTICATION—When possible, use tools provided by the OEM (original equipment manufacturer) to verify products are authentic. This includes UL, ETL, CE, NEMA (National Electrical Manufacturers’ Association) etc. certification. It probably also includes in the advertised package 1.) Owners’ manual or use and care guide, 2.) Warranty card, 3.) Installation instructions, 4.) Contact numbers for problems that may arise during use, 5.) Web site for additional information and customer support. SCRUTINIZE LABELS AND PACKAGING—Check for certification marks on the packaging and avoid products lacking any identifying branding or labels. Be very leery of additional markings or labeling not applied by the OEM. Look for poorly labeled products and date codes obviously in error or out of date. AVOID “BARGAINS”—If it’s too good to be true, it probably is. Make comparisons with other products of the same type. In other words—shop the product. Use the Internet to research the product prior to purchase. It is not a bad idea to call the manufacturer is questions of authenticity arise. PAY CLOSE ATTENTION TO PRODUCTS PURCHASED—You MUST look the product over to determine if in your own mind the quality of workmanship is what you would expect from a “brand-name” manufacturer. Be cautions of products that seem cheap and poorly assembled. MAKE SURE EVERYTHING IS THERE—Counterfeit products often don’t include supplementary materials such as owner’s manual or product registration cards. Sometimes, even parts are missing. REPORT SUSPECTED COUNTERFEITS—Contact the brand owner and let them know you suspect a counterfeit product has been purchased. Let them “chase” the imposter. This action could insure the product is removed from the marketplace. If you are buying online, I would definitely ask associates and wholesalers for recommendations relative to the products advertised. Their misfortune once known could save you time and trouble and most of all provide safety for the end-users. Any comments you might have will be greatly appreciated.